Peter (Levi Miller) is snatched from his London orphanage and shanghaied into Blackbeard (Hugh Jackman)’s Neverland work camp for orphaned boys. There, he meets James Hook (Garrett Hedlund), who helps him escape into the jungle after Peter reveals to Blackbeard that he has the ability to fly. When Peter and Hook encounter the jungle natives led by Princess Tigerlily (Rooney Mara), Peter learns of a prophecy foretelling that he will defeat Blackbeard. In order to save Neverland, Peter must become the Pan. I grow weary of Peter Pan remakes (Yes, that includes the horrifically bad Peter Pan Live!). With the exception of Hook—which I personally think is the greatest Peter Pan film—the movies are the same story and concept with updated aesthetics. As I’ve said, if you’re going to remake a movie, don’t just redo it with better technology. You need to provide a vision or approach to setting, characters, or story that we’ve never seen before. Seriously, just do SOMETHING different so I’m not paying to watch the same movie again and again. Now, Pan does go a different route. It starts the story from more of a prequel stance. We see Peter’s first visit to Neverland, the first time he flies, and his initial introduction to James Hook, Smee, Tigerlily, and Tinkerbell. While I do appreciate that director Joe Wright and writer Jason Fuchs tried to give us something different, the fact of the matter is that, if there were to be a sequel to this film, it would still point us down the path toward the original material. So it’s not actually anything new or different. It just pretends to be. But what upsets me most about this movie isn’t that it’s unoriginal. It’s more that it’s a really, really, really bad movie. When you think of Peter Pan, what do you picture? A magical adventure to a fantasy world full of fairies, mermaids, and pirates where things beyond belief happen. Pan has those elements, sure, but they aren’t magical. In fact, they’re executed to the point of “Well, we have to since it’s a Peter Pan story” rather than a “Let’s take the audience on a fantastic journey, where they’ll be reminded of the magic of imagination and childhood.” For a story rooted in magic and youthfulness, this was an uninspiring and tired way to showcase that. And then, of course, there are all of the other issues that make Pan the craptastic mess it is. The cheesy CGI in Peter’s flying scenes takes away from what was the movie’s only “Wow!” plot point. Then there’s Garrett Hedlund playing young James Hook as if he were Indiana Jones stuck in the Old West with a voice like Optimus Prime. Or Hugh Jackman’s terrible wig and costuming for Blackbeard, which was borderline cultural appropriation (I’m not talking the Spanish conquistador look. I mean the Asian-inspired look). And don’t even get me started on goddamn Tigerlily. Not only was her minimal speaking, eye-candy role a waste of a potentially good character, but there’s the whitewashing issue that keeps happening in film (See: Exodus: Gods and Kings). Fine, you want to cast a white woman to play Tigerlily because (and I quote) “There’s a misconception about the ethnicity of the original character, and we felt no obligation to perpetuate that misconception.” Sure. But then why did you cast a white British boy as Peter? You weren’t obligated. It should be noted that Pan does have people of all ethnicities among its cast throughout the movie. But most of them are extras in the background during the orphanage, pirate ship, mine, and native scenes. And the only people of color who get speaking roles? All relegated to secondary and tertiary roles: Blackbeard’s right hand man Bishop (Nonso Anozie), Hook’s soon-to-be right hand Smee (Adeel Akhtar), and Chief (Jack Charles), who leads the native tribe and gets all of two lines before he’s killed off for White Tigerlily. It’s bad enough that Peter is a White Savior. And then the assclowns behind this movie go and set everything back even farther. Great. 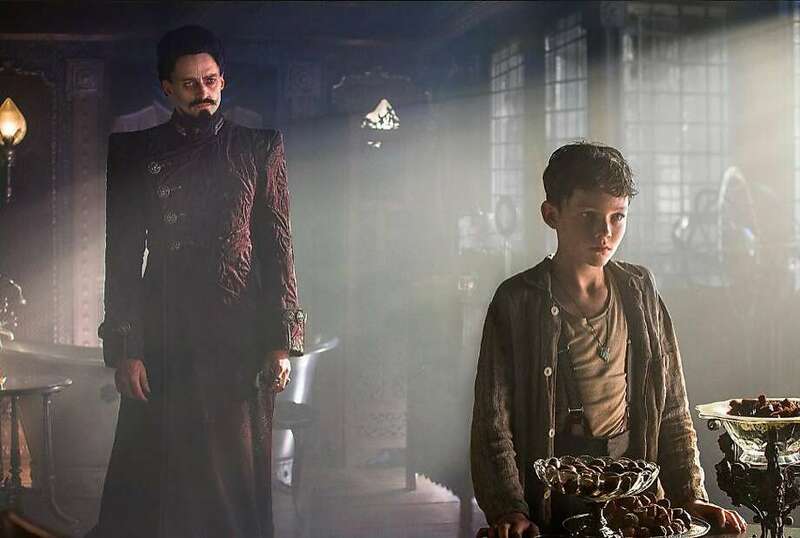 Overall, Pan might look like it’s going to be “interesting” because it’s telling the story of how Peter Pan and James Hook met and became friends before their infamous rivalry. But no. It’s a whitewashed pile of garbage that doesn’t even take advantage of its imaginative and magical source material to show us the wonder of youth. And in case you need more reason to avoid Pan, they also try to make it cool by singing “Smells Like Teen Spirit” and “Blitzkrieg Bop.” LOL NOPE.